Life gets pretty simple out here. There’s the boat, the people, the food, the garden, and our work. One thing you do is pay constant attention to what the boat needs, because if the boat get what she needs, you get to where you’re going – as efficiently as possible. You also keep bad things from happening, by constantly checking for Enemy #1 – chafe – and anything else that might be improper. You can tell what the boat needs just by the sounds. You quickly come to know what each sound means and what is making it. That creak over there is the block that holds the preventer, a line tied to the end of the boom. 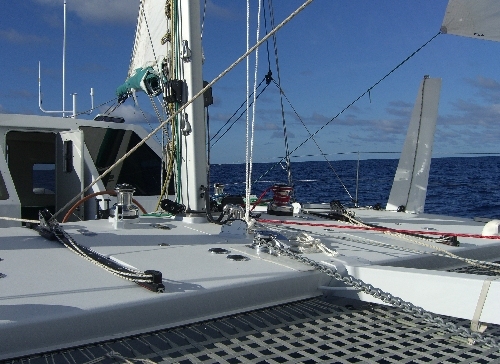 It prevents the boom from going too far in any direction (for any non-sailors, the boom is the horizontal tube at the bottom of the mainsail, perpendicular to the mast). When you’re sailing in ocean swells, as we are, keeping the boom secure is a good thing. Otherwise the mainsail will start flapping around and fail to keep the wind flowing smoothly over its surface. The water going past the boat also makes a distinctive noise. You can tell how fast the boat is going just by the sound of the water flow. The GPS tells us how far we are from St Helena and where we are relative to the “rhumb line,” the direct course from Cape Town to St Helena. The wind is basically behind us, and you can’t really sail directly downwind in a cat, so we are sailing at an angle to the wind, first one side and then the other. Going from one side to the other, with the wind behind you, is called gybing. I did my first solo gybe today, early this morning while Philip was sleeping, and am proud to say it went fine – and I managed to do it so quietly that he never woke up. With our current setup, you have to first bring the main to the center of the boat, then pull the thin, nylon sock down over the big sail (yes, all the way down from the top of the mast, pulling on a line attached to the large plastic hoop at the bottom of the sock), then pull the big sail to the other side of the boat, then set up all the lines on the new side, then pull the sock up and let that big sail loose. If the wind is coming from one direction and the sails aren’t set for it, Horizon starts to get “mushy.” You can feel her slowing down, like she’s walking through mud. 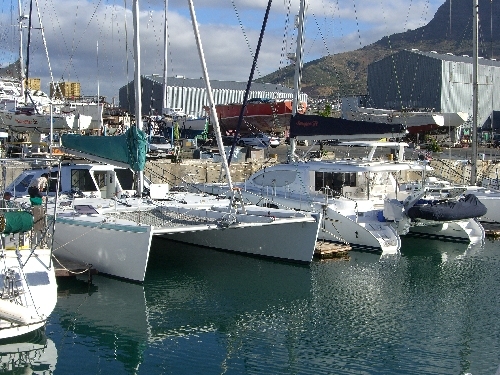 The large jib starts to collapse, instead of being in its best state – all puffed up and ready to party. If the sails are set right, and the wind increases just the tiniest bit, Horizon starts to surge. She accelerates in a way a monohull never does. This boat is much lighter and has very little surface in the water relative to the size of the boat – because everything is floating on two slim hulls. You can see just how thin the hulls are, in the shot of Horizon below, taken when we were in Elliot Basin. That’s Semper Fi just to the right of us, a new catamaran owned by our friends Greg and Michelle. Going back to Horizon’s speed…if the wind increases from 4 to 8 knots, she goes from 3 knots to 6 knots, the speed steadily climbing about a third of a knot per second, until she is merrily surging forward. If the wind gets stronger, even up into the upper teens, she feels just like a car built for speed. She seems to be happiest running at 8 – 9 knots. The ride is smooth; you can barely tell you’re moving. If she starts going faster than that, the noise alone makes you wonder how the boat is going to survive it. It is, of course; we’re well within the design specifications. It’s just the way it feels. As she surges, she makes her own wind. “True” wind is what’s blowing, and “apparent” wind is the combination of true wind and the wind made by the motion of the boat. The angle of the wind changes as the apparent wind speed rises. The wind direction swings around so it’s coming more from the front of the boat. Still no signs of other life, not a single ship, and only one small bird yesterday. “Land ho” – St Helena – is about 250 miles from here. This is the first 25% of our journey to New England, and it will have taken us two weeks to get to St Helena. So 6 weeks more is a safe assumption. Our friends on Semper Fi didn’t leave South Africa after all; they had to get a few more things fixed before they could leave. They have hired a delivery captain and taken on some experienced crew – a couple – and plan to set off for America in the next few days. Both Greg and Shelly are management consultants; Greg actually met with the top brass at the catamaran company for something like 4 hours, when they were in the States recently, detailing how he went from “delighted” to “disgusted” – because of all the things that went wrong with their “new – as in, “there shouldn’t have been any problems” catamaran. We wish them the best as they begin their journey. Here’s a shot of Semper Fi leaving “the first time,” out of Elliot Basin. 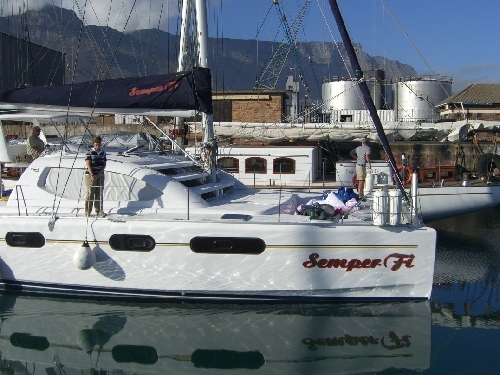 Greg is at the helm, on the left, Michelle is holding the fender, and Larry is on the bow, looking back toward Table Mountain. It was a rare, calm morning in Elliot Basin. Speaking of friends, I’ve been thinking on this trip how much our lives are defined by our friends and family. My very essence is tied to the people I love. I see faces and smiles and hear laughter, in my mind’s eye, as we move along on the open ocean. These memories and images are as much a part of me as the pure, clean air I’m breathing. I also admit I am missing the special people we met and befriended in Cape Town. Some people just become lifelong friends, from the moment you meet them. There is a shared understanding about what matters and what doesn’t, and what is good – and what is not. You rapidly get to the point where you can joke about your character flaws, in a way that teaches and enriches, and you quickly develop a set of shared observations that become fodder for ongoing jokes. So special, those we love. Well, Horizon is surging, after slugging along in 5 knots of wind. The wind is now 8 knots and rising, and she’s found her feet.